Art and ritual are near relations, and this eclectic compilation of artworks, artifacts and films depicting or emanating from performed rites and ritual activities encompasses the spiritual and the secular, and presents ceremonial acts and symbolic transformations of experience. 2013 marks the 100th anniversary of the riotous Paris premiere of the avant-garde ballet The Rite of Spring. Sacrificial pagan rituals of ancient Russia were portrayed in what was virtually an early manifestation of performance art: with stylized sets and costumes, Nijinsky’s barbaric choreography was danced by the Ballets Russes to a dissonant musical score by Stravinsky. Wilma Johnson (born 1960) was stunned by a London production of the ballet in the late 1970s, and the experience directly inspired her paintings of pagan rituals: a series of arcane fertility rites and naked figures dancing around maypoles, all depicted in vivid colour. The pagan influence was also very evident when soon afterwards she became a co-founder of the Neo Naturists in 1980: a ‘live-art’ group who combined ideas of ancient rituals with contemporary life, performing naked apart from body paint. Jennifer Binnie (born 1958), another Neo Naturist, has long been influenced by ancient pagan themes, and her paintings reference life with animals and the cycles of nature. Binnie studied in Portsmouth where she met Grayson Perry in 1979, and they were partners for the following seven years. They moved to London in the early 1980s, performed regularly with the Neo Naturist Cabaret, and had studios in a squat in Mornington Crescent where Binnie made a pair of monumental portraits of herself and Grayson Perry. Painted with primitive intensity on canvases lashed to tree branches, they represent Binnie and Perry as ancient Britons: archetypal figures with patterned, decorated bodies. She says that “the patterns represent what’s going on inside the bodies in both a physical and an emotional way…”. The schematic designs of hearts and the bones suggest the bodily organs but also “represent something quite deep and emotional that is on the inside of a body and not on a surface”. Grayson Perry’s teapot inscribed with the text ‘I am a planet/I am the future/To love me is /To love your next life’, was made around the same time with decoration incorporating graphic sexual symbolism. This vessel made for the everyday social or ceremonial ritual of making tea, has become a ritual object in its own right. Bruce Lacey (born 1927) is one of Britain’s great visionary artists. He concentrated on assemblages and machines and performance for over thirty years before beginning to perform his own shamanistic and earth goddess rituals on large graphic paintings laid on the earth. Lacey says that his paintings are “of the magic processes of love and diagrams of rituals”. He always starts a ritual with “an earth, fire and water celebration as a sort of spiritual tuning in” and “believes in real magic and that all things are connected in a spiritual, telepathic way… .” He feels a connection between his activities and natural phenomena. Between 1954 and 1968, British artist N.H.Stubbing (1921-1983) made a series of works he referred to as ‘Rituals’ or ‘Ceremonials’. They were produced by his placing his paint-covered hands directly on the canvas or paper support. The initial inspiration for these hand-printed works came from his seeing the Palaeolithic murals in the caves of Altamira in 1949. Painting was a devotional act for Stubbing, and his interest in shamanism, Druidic rites, and in the legends of Native American Indians, led him to incorporate ancient symbols and mythological references into his work. His monumental painting, Celtic Story of 1967, was one of his final ritualistic paintings made with his hand-prints. Smoking narcotic drugs has been part of many shamanistic rituals since ancient times. The habitual rituals that evolved around the preparation for smoking opium attracted the uninhibitedly decadent Baronet, Sir Francis Rose (1909-1979). He was first introduced to opium when he was in China in the 1930s, and in 1950 depicted this ritual and its paraphernalia, in a luridly coloured monotype painting. Benin-born sculptor Gérard Quenum (born 1971) creates dark, ritualistic totems from ancient wood and battered dolls that have “experienced many lifetimes”. The wood is often from objects that have been used in the community for many years and the dolls originate from European aid packages sent to African children that Quenum collects after they have been played with and finally discarded. His work directly relates to established African traditions and practices, both social and spiritual, and he often references the guardian figures used by priests and diviners in Benin. Paul Benney (born 1959) paints enigmatic figures and shamanistic presences in works that have been described as “introducing us to people who dwell in mysterious hinterlands, who belong in places that lie somewhere between the earthbound and the transcendent”. He has a “deep interest in the intangible world we see beyond the mirror”, and his allegorical paintings are not quite of this world. Christine Khondji (born 1947) has made effigy/doll figures with attached talismanic drawings that reflect her experience of being initiated into the Gnawa cult in Marrakech by a Moqadema (priestess) – the Gnawa musicians play hypnotic music during their trance rituals, and Khondji is interested in Jungian aspects of paganism, where ritual is intended to court the unconscious. Since the 1980s, Jim Skull (born 1959) has been creating elaborate woven skull sculptures using rope, Papier-mâché, beads and other natural materials, and changed his name to reflect this obsession. Born in New Caledonia, much traveled and now living in France, he has been influenced by the tribal arts of Oceania, Africa, and North America. Shaun (Farouq) Molloy (born 1957) produces mesmerically patterned drawings while in a trance-like state, always following an instinctive ritual process during which he starts from the bottom of the paper with no prior plan or preconception – from this ritual process came works with an affinity to Islamic art long before Molloy became consciously aware of Islam in the early 1990s when traveling in North Africa. In the 1990s, Giovanna Miralles lived for three years with the Mayan people in Guatamala, learning about their traditions and customs. She became an Aj’quijab – the one who works the fire – a Mayan priestess. She aims to continue the Mayan traditions and keep them alive, performing rituals in a contemporary context, blurring and crossing boundaries between the sacred and the mundane. Miralles has presided over Mayan ceremonies in Britain, most recently at Baltic in Gatehead. She and her anthropologist husband Peter Wilkins produced a documentary film about a 24-hour ritual in Bolivia. For rituals during the exhibition, she has arranged an altar inspired by the Quillacas offerings for the Umaturca, as seen in the documentary. Other offerings are influenced by the mesa blanca made in her hometown of Oruro in Bolivia – the white ‘biscuits’ are symbols of what is hoped will be realized during the ritual. The painting La Mano Poderosa by Cecilia Vicuña (born 1948) is based on an image from Colombia called “The All Powerful Hand”. 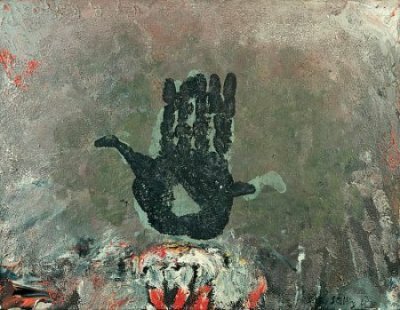 Vicuna’s version has a talismanic quality and depicts a giant hand surrounded by many tiny hands in a work she has described as portraying “a saint in reverse”. Sandra Sheehy (born 1965) creates biomorphic, cocoon-like objects encrusted with fragments of fabric, stitching, beads, sequins, paint, and shells together with intricate wrappings of thread or yarn. This wrapping process is an obsessive, private ritual: she says that “I bind up details, tuck away and conceal, bury things deep in folds”. Sometimes she “feels the need to burn them open again” in a process that “releases parts that I had made and then hid from view”. Georgia Russell is known for slashing, cutting and dissecting printed matter, which she then manipulates and re-constructs into sculptural paper-works. The dissected book in this exhibition has been cut and shredded to resemble an shamanistic mask with affinities to African art. Other works in the exhibition include Jack Bilbo’s (1907-67) satanic ritual painted in Berlin in the 1960s; and a 19th century painting by Ponson of a sorcerer casting a ritual spell with Fuseli-like spirits hovering in the background. The monotype of a funerary rite by William Gear (1915–1997) dates from his time working in Paris in the late 1940s, and reflects an interest in Celtic myths and stories that he shared with other members of the Cobra group with whom he was associated at that period.